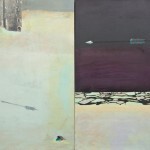 From October 13 to November 12, 2011, the Bellevue Gallery will feature Snow Asylum, the latest works by Marion Llewellyn. 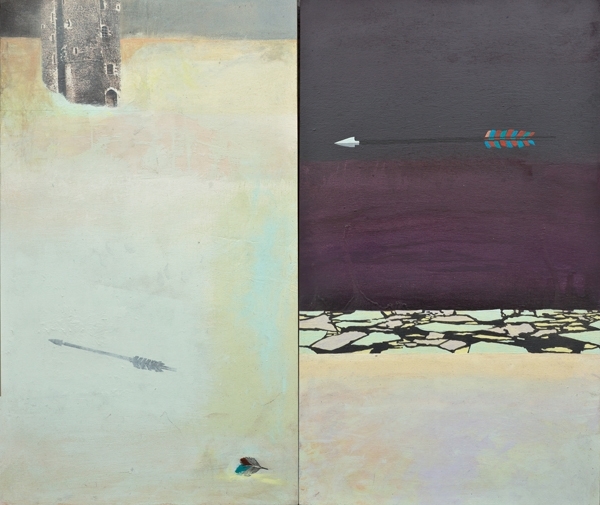 For Marion Llewellyn, this new series of paintings is born out of her experience with post-traumatic stress disorder. Nineteenth century language associated the word asylum as a place of punishment and incarceration. Marion’s choice of the word for the title of this series refers to its original meaning: a place of refuge, a haven. Using a subtle, muted colour range Marion has imagined a snow landscape that creates a feeling of calm. Snow is seen as both camouflage and protection. What roots Marion to her journey through the post traumatic stress experience is the prevailing ambiguity the icons and imagery provoke in this series. For example, does the image of an arrow convey impending attack or is it a symbol of the messenger of good news? It is the artist’s intention to demonstrate that when we witness or experience conflict or injustice on an scale, we are changed. To what degree, or how we process the conflict is unique for each individual. Marion challenges the viewer to explore their own set of symbols and how they influence our lives. In this unique series of paintings Marion tells a story, underscoring the point that history not only bears witness but also retells our own stories.